The price of gold should be how high or low in the next five—ten years? Fractional reserve banking, governments and central banks debase currency units every day. So, what will gold be worth in ten years? 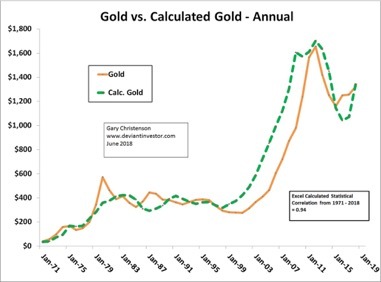 Four years ago I wrote the book “Gold Value and Gold Prices From 1971 – 2021.” The book provided a calculation for an equilibrium value of gold based on three external variables. Official national debt as a proxy for currency in circulation. Price of crude oil as a proxy for the commodity aspect of gold. Price of the S&P 500 Index as a sign of the desirability of paper assets (S&P 500 stocks, bonds etc.) versus hard assets and commodities. Gold prices rise when currency in circulation increases and the banking cartel devalues currency units via debt creation. Gold prices rise and fall as commodities, particularly crude oil, rise and fall. Gold prices are negatively correlated with stock prices. Rising S&P prices correlate with falling gold prices, and vice versa. Investors showed their preference for gold by buying commodities more aggressively than the S&P during the 1970s. During the stock market boom years from 1982 to 2000 gold languished while stocks zoomed higher. Following the stock market crash in 2000 gold rallied into 2011, while the S&P fell, rose, fell and rose. After August 2011, the banking system pumped a massive quantity of currency units into the stock market and pushed gold out of favor. Gold fell into its low in December 2015 as the S&P rose to multiple all-time highs. The formula for calculated gold is based upon National Debt times Crude oil divided by the S&P 500 index. It weights each of those three variables with an exponent that ranges from 0.15 to 0.75. The result for the past 47 years is this graph. The Excel calculated statistical correlation for the model is 0.94, which is good. 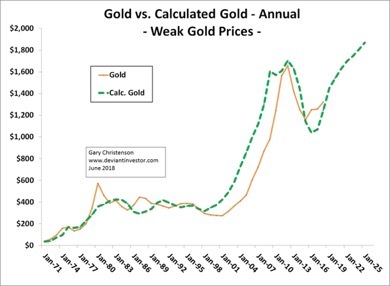 Note that calculated prices can lead or follow market prices for gold. Also, market prices can spike higher or lower than calculated prices. Daily gold prices rose to more than double the equilibrium price in January 1980. The market price in 2001 was well below the equilibrium price, and the high price in 2011 was above the calculated price. National debt has risen about 8.8% per year for many decades. Current tax and spend policies may accelerate that exponential increase, but debt should increase 8% to 10% annually for several more years. Crude oil will rise much higher or fall lower, depending on many incomprehensible variables. A global recession would reduce demand while a Middle-East war would restrict supply. Prices for oil have varied widely in the past and will be erratic in coming years. The price range from high to low is large. The S&P 500 Index reached all-time highs in early 2018, after rising since early 2009. I find it difficult to believe the S&P can rise from here without massive infusions of currency units and “printing” far more debt. Worse, the Fed claims they are reducing, not increasing, their balance sheet. Expect the S&P 500 to fall in coming years, particularly when compared to ever-increasing debt. A crash is possible. Graphs of the ratios of crude oil and the S&P to debt are available here. I have input three scenarios into the model and calculated equilibrium gold prices based on those possibilities. Strong gold prices: Debt will increase at 9.3% per year instead of 8.8%. Crude oil will rise to around $250 in 2024. The S&P will fall to about 1,400 in 2024. This scenario suggests dollar weakness and seems likely. Moderate gold prices: Debt will increase at 8.8% per year, as it has for decades. Crude oil will rise to about $175 in 2024. The S&P will fall to about 2,000 in 2024. This scenario is a “more of the same” approach and seems likely. Weak gold prices: Debt will increase only 8.3% per year, which I consider unlikely. Crude oil will remain about $75 for the next six years, which I consider unlikely. The S&P will remain strong, supported by the banking cartel, and will rise to about 3,200 in 2024. An unlikely scenario! Read “Asset Prices Divorced From Economic Reality More than Ever” if you are inclined to believe the “weak” gold price scenario. 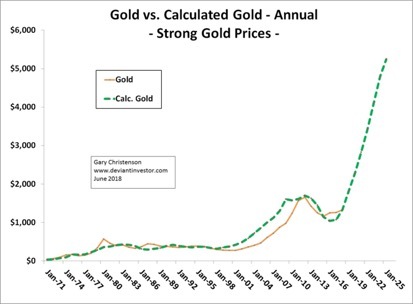 The model produced the following three graphs from those inputs, which shows equilibrium gold prices of about $5,000, $3,800 and $1,800 around 2024. If you believe national debt will rise more rapidly than average, that crude oil prices are still low and will rally for many years, and the S&P is a bubble pressing against a pin, expect a “strong” gold scenario. If you believe rising crude oil prices and weaker stock markets are likely, plan on a “moderate” gold scenario. If you believe crude oil prices will remain flat for years, and Wall Street will support the current (already over-extended) stock bubble for another 5 – 10 years, plan on a “weak” gold scenario. You may be disappointed. The model is a valuation model, not a timing model. It has a decent but imperfect record over four decades. Neither discount it nor blindly trust it. Past results do not guarantee future prices. Debt, spending, wars, political payoffs, and economic nonsense will never disappear, but we should be less certain about future prices for crude oil and the S&P. Market prices for gold can spike higher than equilibrium prices by 100% or crash lower by 35%. When the market price is considerably lower than the equilibrium price, buying makes sense. When future gold prices, based on expectations for debt, crude oil and the S&P, are much higher than current market prices, buying makes sense. When market prices for gold are higher than equilibrium prices, caution is warranted. Hyper-inflation may not occur in the United States. But if the “powers-that-be” choose hyperinflation, it will boost gold prices to unbelievable levels. The inevitable consequences of current economic nonsense may manifest in months or perhaps not for a decade. Russia and China have accumulated large quantities of gold bullion (not the paper stuff) because they understand debt based fiat currencies have a limited life expectancy. The U.S. dollar may not disappear for decades, but its purchasing power, measured in the commodities we NEED, will decrease in coming years. 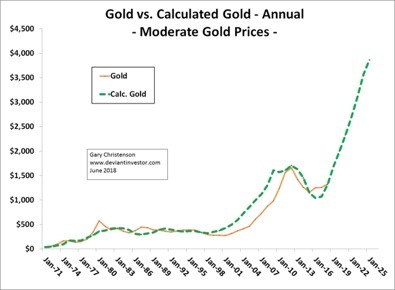 Even in the “weak” (unlikely) gold price scenario above, the equilibrium price of gold will rise to about $2000 in the middle 2020s, so risk is minimal. By contrast, examine monthly charts of Amazon and Netflix (not shown) for examples of high risk. A swap from over-valued stocks into gold (and silver) seems reasonable and appropriate, particularly if you agree with the assumptions for the “moderate” or “strong” price scenario. Miles Franklin can assist with that conversion from over-valued stocks into under-valued precious metals. If gold prices rise a little, silver prices will rise a lot… Read Bill Holter on silver.